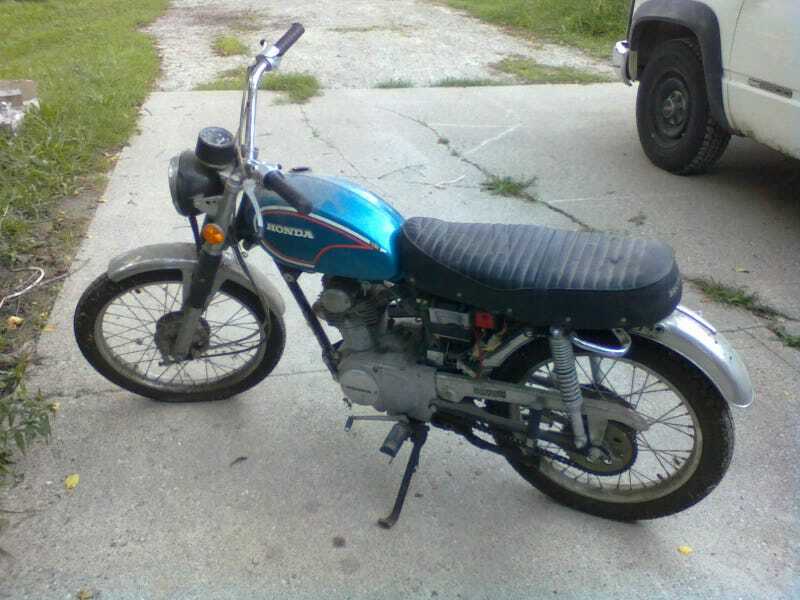 Well Oppo, I’ve got a new project to play around with: a “ran when parked” 1973 Honda CL100. Here’s the deal: I told my father that I’d get his bike running again for him, provided that he dig it out of his garage. (A significant undertaking for him, but how could he resist?) I’m not gonna lie; this is kind of a big undertaking for me, too. I consider myself pretty handy with a wrench, but I don’t know anything about bikes. I’m not even a rider myself. So just what exactly am I up against here? The bike has been stored in a garage for the past three decades. That’s right; it hasn’t been run in about thirty years. Now that it’s in my possession, I’ve taken a moment to rinse the dust and cobwebs off and start evaluating it. There is no connection between the fuel tank and the carburetor. Keys are currently missing (but might turn up soon, otherwise I’ll have to source new ones). Also, there’s supposed to be a panel covering the battery here, isn’t there? Bolts for the fuel tank, seat, and grab handle are missing. I don’t know what exactly it’s supposed to look like, so I’m not sure if it’s missing anything else, or if there’s anything out-of-place. Are the front reflectors supposed to be pointing in different directions like this? This will not be a full restoration. I will be focusing my efforts in two phases: getting it running, and getting it roadworthy. I found a PDF shop manual online, and have only begun to tear into it. I will share my preliminary findings in my next post.